I’m terribly grateful for all the amazing seasonal birds I saw this weekend, but none more than the Glaucous Gull that winged by while a group of us waited fruitlessly for a formerly abiding King Eider to turn up. What made this white-winged gull special was, first, that I identified it on the wing and got the group on it and, second, that this happened to be a lifer, though I didn’t realize it at the time. Corey had an easy time deciding what his Best Bird of the Weekend was. 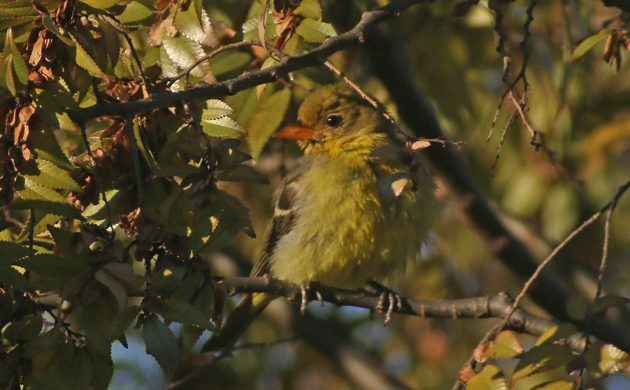 After all, he got a new bird for Queens this weekend, a Western Tanager! The long-staying bird had been in the vicinity of the Alley Pond Environmental Center for nearly two weeks and it took Corey four tries but he finally saw the bird!